While we wait for the final installment of the latest Star Wars trilogy to arrive, I have just the book to fill the galaxy-sized hole in all of our hearts: Making Solo: A Star Wars Story by Rob Bredow, co-producer and Head of Industrial Light and Magic. And galaxy-sized was not just a lame attempt at a Star Wars reference, this thing is massive. It’s not my first peek-behind-the-camera book – I own two Art of Star Wars books from Rogue One and The Last Jedi. They are roughly the same size as this book. In the event of a zombie apocalypse, they would make very good weapons. Naturally, as he was involved in bringing the visual effects of Star Wars to reality, and Star Wars films are very visual effects-y, Bredow has quite the journey to take us on. As he explains in his introduction, the original trilogy captivated him as a child, and a shot of Dennis Muren and the AT-ATs inspired the direction of his future career. Being asked to work as co-producer and visual effects supervisor for a Star Wars film is a personal dream come true, which is clear throughout this book. Most of the photographs were taken by him, and a lot were used for artist reference images. And the photography is hell of a pretty – if it was a book purely of photographs I would still be smiling. Before I even worked past the contents page I was blown away by the aesthetic glory of the shots. Whatever your personal opinion of Solo, it was a beautifully shot movie, and this is reflected in its making-of chronicle. The opening image is a black and white of the motion capture structure stage thing they used to shoot the cockpit shots on the Millennium Falcon. My poor, fragile nerdy brain nearly exploded. 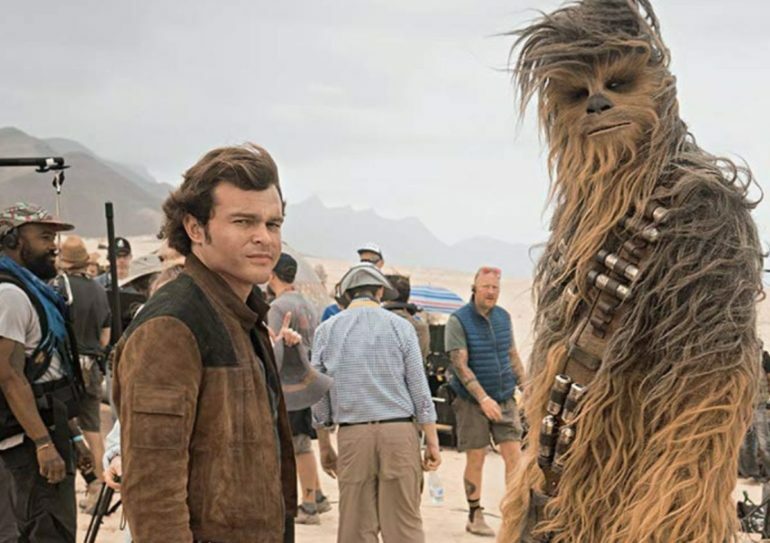 Making Solo: A Star Wars Story is thorough in its coverage, divided neatly into pre-production, production and post-production sections. And there’s not one page that doesn’t contain a glossy picture of something cool. For the nerd who loves to kick back and peruse pretty Star Wars centric pictures at leisure, this would make the perfect present. A particularly sweet section is the school project carried out by Bredow’s daughter who had to interview a photographer, and chose Solo’s Director of Photography Bradford Young. Also included are some precious shots of Young with his small son. When Bredow talks about his colleagues, it’s clear how deeply he thinks of them as friends. It’s also great that so much of the story is told not just in Bredow’s voice. He has sound bites and mini-interviews from many important people who worked on the film – from Syvaine Dufaux, the talented first camera operator, to Neal Scanlan, the creature effects supervisor who worked on Six Eyes, to Kyle Wetton, the senior digital asset manager who was ‘treated’ to Donald Glover’s singing far too early in the morning. Seeing the human effort behind such a cultural cornerstone as Star Wars really adds a new depth. People worked so hard to bring the world to life. On more than one occasion, it is casually mentioned that they had to break new ground to bring the effects to life and fully immerse us into the world, from using a mixture of iPads, lenses and actual rocket fuel to create coaxim, to zooming around the Dolomites in a helicopter, to sending the cast through hyperspace with rear projection technologies. Almost every section references the vast array of departments that worked in close collaboration for practically every shot of this film, much more so than they would be required on your average film. My favourite aspect of Star Wars has always been the depth of the worlds we visit – how we see glimpses of these planets teeming with peoples and races whose backstories are just as intricate as the main cast. In terms of storytelling, it’s a limitless well. And it’s thanks to people like Bredow, who put every ounce of their knowledge, experience and creativity into making it a universe we want to visit again and again. There’s a lot of heart in this book – honest, intimate photos of the cast and crew, high moments of filming, the incredible minute details in every location, stunning landscapes. It seems almost a shame that the actors in movies like the Star Wars saga are the ones who bag all the fame, when the faces we don’t see have poured parts of their soul into the creation. I was grateful that this book was written to rectify the balance a little. It was a pure delight to be taken on the hectic journey of making a film, and gave me a new appreciation for all the Star Wars films, including Solo. I liked it so much, I won’t even end my review with a terrible space pun. The effort behind Star Wars is extraordinary, which this book highlights perfectly. Getting to peel through the lens at how they conquered every logistical challenge to create a visually stunning film is a pure delight.